I needed to bevel the edges of a work pieces for a project I was working on. Bevelling the first edge was easy using the rip fence on the table saw. But when I tried to bevel the other side, the sharp edge of the first bevel jammed under the rip fence. To cut the second bevel, I built a carriage, see drawing. 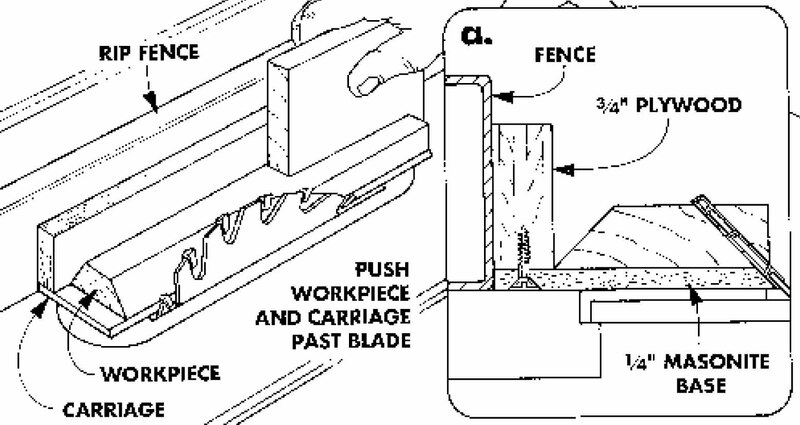 The work piece rests on the carriage and the two are pushed along the rip fence together. This way the edge of the first bevel can't get jammed under the fence. And it's protected from damage. I made the carriage with a plywood fence and a Masonite base, see detail a in drawing. Start with a base that's wider than the work piece. 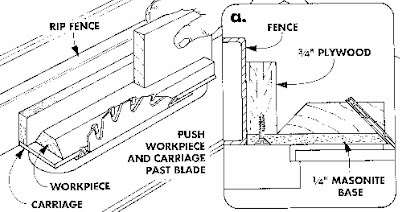 This prevents tear out along the edge as you cut the bevel. White faced 5mm foam board in 80mm strips with a 60 degree bevel cut on each edge. 1000mm long strips.